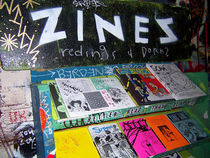 clpzines is one of more than 5,000 organizations on LibraryThing. The Borough is My Library #4 by Alycia Sellie, Ed. About meWell hello there! This is the adult zine collection at the Carnegie Library of Pittsburgh's Main branch in Oakland. We're a browsing collection, located in a cozy nook on the First Floor near the Fiction stacks. About my librarySubjects include DIY/How-To; LGTBQIA+/Gender; Personal; Art/Comics; Feminism; Literary; Activism; Zines/Librarianship; Food/Gardening; Bikes; Parenting/Kids; Prison; Race; Travel/Cultures; Labor and Health/Body. Please bring us your locally-authored zines, we'd love to have them!